Goat Yoga is about disconnecting from day to day stress, illness or depression and focusing on happy vibes! Join us for 30 minutes of Goat Yoga followed by Goat Happy Hour. 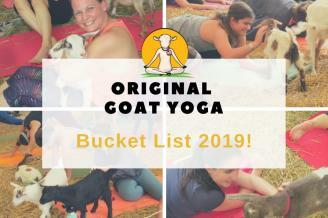 (This is what we call Goat Therapy) If you're traveling to PA THIS is your bucket list experience! Goat Yoga takes place at Hayman Farms.